I adore cables, and love the texture of them when knit! 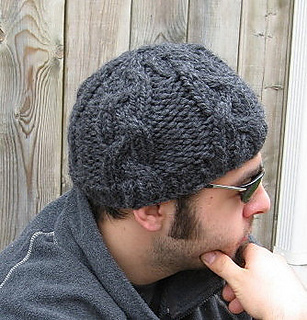 This is a super easy project, and the yarn is thick enough that the hat knits up in no time. A great way to practice cables, practice using circular needles and dpn’s! Just under half a skein is used to make the adult sized version - so in fact 2 can easily be made from one skein, with a little left over. Great idea if you’ve got 2 guys to knit for, for this winter! There is both an adult (21” head) and tween (19” head) sizing for this pattern. This hat will stretch to a 23” head or so with ease. I had originally submitted this pattern in hopes to have it published either in a print or online knitting magazine for the upcoming autumn or winter issues, but no luck there, so I’ve posted it on my blog for free for anyone who wants to make it. eta: in case anyone’s wondering, my brother was kind enough to model the hat for me, and since it’s so warm, he has swiped it as his own hat! His head circumfrence is slightly over 23”, and fits him perfectly.